LOOKING FOR A PREVIOUS STORY? CHECK THE ARCHIVE. It's been a hot time at the races lately in the Ohio River Valley. Two of the world's most prestigious showdowns in speed have just whizzed by in bang-bang succession: the Kentucky Derby in Louisville on May 6, soon followed by the Indianapolis 500 on May 28. But there's another blisteringly expansive race playing out inside the Ohio Valley. Within a regional radius of only 150 miles (240 km. ), DHL, FedEx and United Parcel Service – the Big Three in U.S. package delivery – have collectively ponied up more than $1.6 billion in bulking up their distribution muscle. The 4-million-sq.-ft. (371,600-sq.-m.) Worldport operation already ranks as the largest package distribution facility ever built. But the big bopper by far among the area's latest package-delivery deals sits imposingly 150 miles (240 km.) to the southwest of Wilmington, with UPS in Louisville. "Big Brown" unveiled its jumbo-sized Derby City design on May 17, announcing a whopping $1-billion expansion of its Louisville International Airport hub that will create 5,000 new jobs. That's the second-largest capital construction project in UPS's 99-year history. And it's on the very same site as the company's biggest-ever capital construction: UPS Worldport, a super-size $1.2-billion project that the Atlanta-based giant completed at Louisville International in 2002. That 4-million-sq.-ft. (371,600-sq.-m.) operation ranks as the largest package-distribution facility ever built, as well as the most technologically advanced. Worldport processes 304,000 packages per hour – more than 84 every second. Little wonder that UPS chairman and CEO Mike Eskew called Worldport "the centerpiece of our worldwide infrastructure" in announcing the Kentucky expansion from UPS's Sandy Springs, Ga., headquarters. 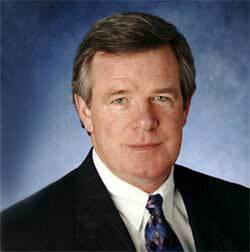 "Expanding [Worldport]," he noted, "is absolutely necessary to support the long-term needs of our customers." Those needs mean that the UPS "centerpiece" will get a lot bigger. Scheduled to start in July, the expansion will add another 1.1 million sq. ft. (102,190 sq. 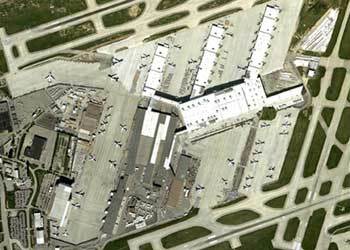 m.), upping Worldport's total footprint to 5.1 million sq. ft. (473,790 sq. m.) – the equivalent of more than 113 American football fields. UPS will add three wings to the main hub building to handle aircraft loading and unloading. 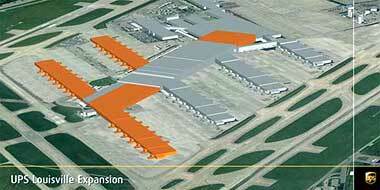 The project will also further lengthen Worldport's conveyor-belt system to 197 miles (315 km.) – roughly enough to stretch all the way from Louisville to Cincinnati and then back again. The company's list of Louisville employees will get much longer as well. Of the 5,000 new jobs, 1,284 will be full-time, with another 3,787 "permanent part-time positions," UPS officials reported. 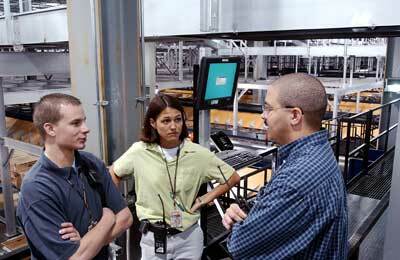 The new jobs will range from operational managers to computer technicians to package sorters. On average, the full-time positions will pay $86,800 a year, UPS said. "If you're a movie buff, you know that the sequel is never as good as the original," Louisville Mayor Jerry Abramson said at the project announcement inside Worldport. "However, I would say that a second billion-dollar investment by UPS is the exception to that rule. . . . It's a blockbuster, one of the three or four greatest announcements this community has had." UPS is already the largest private employer in Louisville, as well as Kentucky as a whole. The company has 18,000 Louisville workers, 8,300 of them at the airport. Statewide, UPS has 22,300 employees. Louisville Mayor Jerry Abramson (left) called the 1.1-million-sq.-ft. (102,190-sq.-m.), Worldport expansion "a blockbuster, one of the three or four greatest announcements this community has had." The orange areas in the aerial photo on the right depict the space that will be added or technologically updated. "Customers always want more: more speed, more reach and more capacity," UPS Vice President of Airline and International Operations Bob Lekites said in explaining the decision to expand an already massive operation. The Worldport expansion is being driven by customers' desires for "more speed, more reach and more capacity," said UPS's Bob Lekites (pictured). with yearly increases of almost 10 percent since 2002. Consequently, the company will increase its main hub's package-sorting capacity by a startling 60 percent. Within five years, Worldport package-handling volume will take a quantum leap from 304,000 packages per hour to 487,000 an hour. "The expansion will take place in two major phases," Brendan Canavan, UPS air district manager, explained at Worldport. 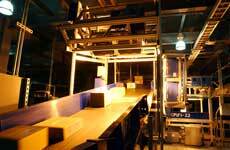 "By holiday season 2009, [volume] will increase by 112,000 packages an hour. And [increase] by another 70,000 at the end of the year 2010." "Everything about this project is big," Canavan commented. That observation is repeatedly echoed in the expansion's particulars. The project's enormous growth ripples will spill over to include about 2 million sq. ft. (185,800 sq. m.) of work on Worldport's ramp areas. UPS will build several new ramps at Louisville International and alter some existing ones. Then there are the jumbo-sized airplanes that are driving much of that ramp work. Louisville International is the home base of UPS Airlines – the world's ninth-largest airline, with 275 planes. 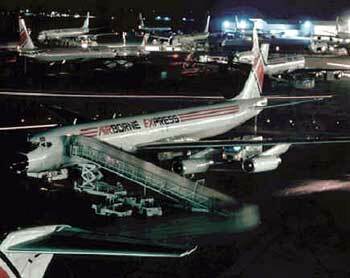 Now that fleet needs larger ramps as UPS adds new oversized planes to increase international efficiencies. The enormous acquisitions will include as many as 20 Airbus A380s – each with a payload almost twice as big as the McDonnell Douglas MD-11, UPS's current global-air workhorse. 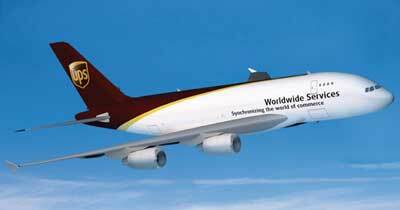 UPS is also buying 10 Boeing B747-400s, another oversized model. Inside Worldport, the project's reach will extend beyond the 1.1 million sq. ft. (102,190 sq. m.) of new space. The expansion will also wash over into 334,500 sq. ft. (31,076 sq. m.) of existing space. Though only four years old, that area will be outfitted with new technology and equipment, UPS officials said. Already, the operation's massive computer network system can process 59 million database transactions every hour. A synchronized camera system, for example, reads each package label's encoded information, triggering an entire network of computer-activated sorting and tracking devices. 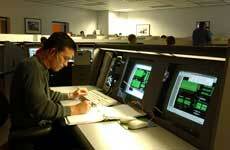 A synchronized camera system helps Worldport's massive computer network system process 59 million database transactions every hour. Even with UPS's sprawling presence, Louisville wasn't a lock for the mega-expansion. Whoever the other contenders were, they would've been hard-pressed to match Kentucky's lightning-fast reactions. This particular site-selection race may have simply gone to the swift. Once UPS shared the particulars of its project with recruiters, only 53 days passed before a final Louisville agreement was hammered out and done. 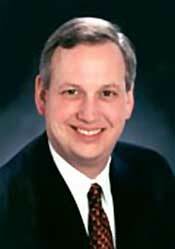 Essentially, state and local officials provided the kind of fast, effective and satisfying delivery that's the Holy Grail of the Georgia-based firm's package handling. "Just look at how far UPS has come with our community, hand in hand," Mayor Abramson enthused at the project announcement. Big Brown "has grown beyond any of our hopes," he added. Kentucky officials first got wind about a year ago that something really big might be in the works. Be on your toes, Hindman advised them; UPS was considering another very large project. At that point in 2005, the company had already started yet another substantial local expansion: a new 700,000-sq.-ft. (65,030-sq.-m.), $82.5-million heavy freight hub at Louisville International creating as many as 1,500 part-time jobs. It was early 2006 before Kentucky recruiters got their first solid idea of just how big a deal UPS had in mind. That was when Hindman shared what he called "rough estimates" of the projected expansion. But there still weren't enough specifics to compute the incentives Kentucky could offer. All that changed markedly in mid-March: UPS was ready to talk hard numbers, Hindman told state and local officials. The UPS executive initially discussed the project in separate meetings with Gov. Ernie Fletcher and Mayor Abramson. Then state and local recruiters got their first look. Hindman shared the project's staggering scale at a March 23rd meeting with Kentucky Economic Development Cabinet Secretary Gene Strong and Greater Louisville Inc. President Joe Reagan in Strong's Frankfort office. That sent Kentucky's deal-sealing machinery into overdrive. A team of high-ranking representatives from the state, city, airport and Greater Louisville Inc. immediately began work on making sure that everything that needed to happen to land the expansion did happen – quickly. One very sizable element came together very rapidly: Kentucky's $51.6 million subsidy package. That represents one of the largest incentive packages in the state's history. Even so, back-and-forth bargaining over subsidies was notably absent during negotiations, UPS and Kentucky officials say. That seemed to owe much to UPS's familiarity with Kentucky's subsidies. From its many previous Louisville expansions, the package-delivery titan was already very well-schooled on exactly what the state was in a position to offer. Specifically, Kentucky's incentives include as much as $31.6 million under the Kentucky Jobs Development Act (KJDA). Created to promote white-collar technology- and service-related expansions, the KJDA for 10 years will provide UPS with corporate income tax credits and allow it to keep state and local income taxes on the new full-time jobs created by the expansion. In addition, UPS will get as much as $20 million in benefits over three years through the Kentucky Enterprise Initiative Act (KEIA). Created last year, the KEIA allows approved firms investing $500,000 or more in Kentucky to recoup state sales and use tax on the costs of construction materials, building fixtures and R&D equipment. Still, a key ingredient remained missing in Kentucky's recruiting recipe: a solid future for the Metropolitan College program. Created in 1998, the Metro College initiative provides students working part-time for UPS in Louisville with free tuition at the University of Louisville or Jefferson Community and Technical College. 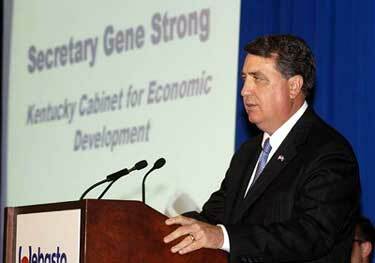 Kentucky Economic Development Cabinet Secretary Gene Strong (pictured) quickly set up several key meetings that ensured the future of the Metro College program. The program is jointly funded by the company, the state and Louisville-Jefferson County government. But the state's existing financial commitment only ran through 2008. That uncertainty wouldn't do, UPS said. The Metro College initiative wasn't a conventional form of assistance, but it was a bedrock essential in the project. If the program's future looked even remotely shaky, Louisville was almost certainly a no-go for the expansion, Hindman told state officials. The Metro College plan, he explained, was that important in UPS's local recruitment and retention. Almost 10,000 part-timers have participated in the program its 1998 creation. Another 1,400 are currently enrolled. And if Louisville got the expansion, UPS was estimating that Metro College enrollment would rise as high as 2,200 students by 2010. Given the project's rapid timetable, there was no way to resolve the Metro College issue in the Kentucky legislature. State lawmakers had adjourned for the year on April 6th. With that, Kentucky recruiters' scurrying flurry of activity had successfully put all the pieces in place. By then, UPS was so comfortable that it scheduled its expansion announcement to begin 30 minutes after the Kentucky Economic Development Finance Authority (KDFA) convened for a special meeting. And, sure enough, the KDFA had already given final approval to UPS's $31.6 million in KJDA aid before company officials had even started talking inside Worldport. "The rippling effect this UPS expansion will have is profound," Fletcher said in Worldport as the company's big plans went public. "These investments will create a better Louisville, a better Kentucky and a better UPS," the company's top-ranking Louisville-based official said in Worldport. 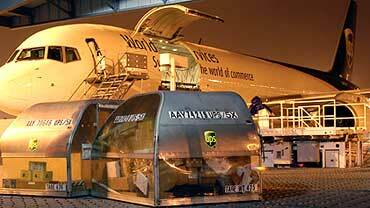 "UPS Worldport has a significant economic impact on Louisville and Kentucky even beyond the creation of UPS jobs. More than 90 companies have moved to Louisville in recent years just to be close to Worldport." Collectively, those firms have created more than 13,300 jobs, investing more than $1.2 billion, according to an economic impact study by the Kentucky Cabinet for Economic Development. Numbers like that underscore the wisdom of Kentucky officials' abiding vigilance in keeping a finely attuned finger on the pulse of a key corporate client. As UPS's local expansion history demonstrates, business and economic development alike aren't races won in short sprints. The laurels go to the long-distance runners. 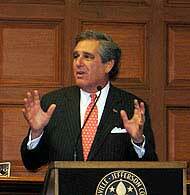 Abramson echoed that long-range perspective inside Worldport. "Our decision two decades ago to expand Louisville International continues to pay off for this community and commonwealth in continued economic development and job growth," said the mayor. "Louisville and Kentucky are flying high thanks to the incredible investment of UPS. With this newest expansion, we'll soar to even greater heights together. "Look where Brown is going to take this community in the next five, 10 and 15 years." UPS certainly isn't the only package-delivery heavyweight that's punching out the lights with its growth in the Ohio Valley. DHL and FedEx Express, too, are major forces in regional expansion. Granted, neither has mounted a project to match the startling scale of UPS's Louisville $1-billion mega-venture (see accompanying feature). Nonetheless, each firm has created its own imposing whopper of a regional expansion. FedEx Express announced its $214-million growth plans for Indianapolis on May 5th, less than two weeks before UPS unveiled its own large intentions in Louisville. The Memphis-based firm's expansion will add 600,000 sq. ft. (55,740 sq. m.) of new space and 800 jobs at its Indiana hub. The FedEx subsidiary expects that the expansion will start soon, with a projected completion date of December 2008. Rising volume in lucrative international deliveries is the catalyst for the Indianapolis growth, FedEx Express officials explained. With the expansion, the global packages that now come to the company's 15,000-employee Memphis hub will be rerouted for delivery through Indianapolis. "International is growing very fast . 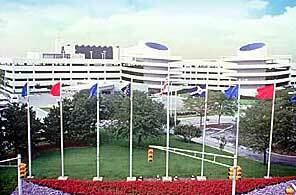 . . flushing more cargo through the entire system," Indianapolis hub General Manager Robert Palmer explained on the tarmac of Indianapolis International. FedEx Express' expansion will increase the hub's existing sort facility by 400,000 sq. ft. (37,160 sq. m.), as well as adding a new 175,000-sq.-ft. (16,258-sq.-m.) secondary sort facility. The new space will increase the operation's sorting capacity from the current 79,000 packages an hour to 99,000 per hour. The project also involves building two other new structures: a 40,000-sq.-ft. (3,716-sq.-m.) facility for aircraft maintenance and an 8,000-sq.-ft. (743-sq.-m.) building for ground support equipment maintenance. The new areas added in the expansion will bring the Indianapolis operation's total space to 2.5 million sq. ft. (232,250 sq. m.). 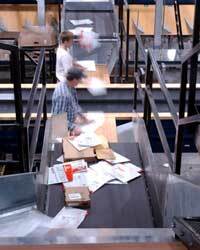 FedEx Express' previous Indianapolis hub expansion in 1998 tripled square footage and doubled sorting capacity. The company's Indiana plans also include adding as many as 14 new gates for wide-body airplanes. Like UPS, FedEx Express is increasing the cost-effectiveness of its global delivery system by going with much larger planes that are now coming on the market. The company has 10 Airbus A380s on order. FedEx Express currently has 80 flights a day going into the Indianapolis hub. The FedEx Express expansion "solidifies Indianapolis' reputation as one of our nation's leaders in transportation and distribution," said Mayor Bart Peterson (pictured). After the expansion, daily flights will increase to 94. "Indianapolis is all about location, location, location," Palmer said of the Indiana project. "It's a great location for us. The airport has a tremendous amount of available land to grow on, [a] great Midwest work ethic and a very business-friendly environment to work in." The expansion also includes FedEx Express' 12-year extension of its lease with the Indianapolis Airport Authority (IAA). In the contract extending the lease through 2028, the IAA agrees to fund and build FedEx Express' new gates, leasing them back to the company. Five of the wide-body gates are to be finished by December of 2006. Construction costs will run about $50 million if FedEx Express decides to build all 14 gates at Indianapolis International, IAA officials estimated. But the company's increased gate leasing payments, they added, will more than recoup those expenses. IAA Board President Lacy Johnson called FedEx Express "a valued member of the city's thriving business community and a key partner in ensuring the airport's continued growth and economic vitality." Already, FedEx's Indianapolis traffic is so heavy that it accounted for 44.8 percent of the airport's overall landing weights in 2005. Airport officials credit that hefty volume and the landing fees it generates with helping control airline fares for local passengers. Most of the Indy hub's 800 new jobs will be part-time positions, company officials said. Employees will work in shifts of four to five hours. All new workers, however, will receive full medical, dental and vision insurance benefits, as well as college tuition reimbursement, FedEx Express officials pointed out. FedEx Express first opened its Indianapolis operation in 1988 with 300 workers. That was the company's second U.S. hub. With the expansion's 800 added jobs, the Indiana operation's work force will grow to almost 5,000 employees. The Indianapolis hub is now the company's second-largest domestic hub, trailing only Memphis. DHL, the U.S. subsidiary of Bonn, Germany-based Deutsche Post AG, faced a very different growth equation in the Ohio Valley: The company had too many hubs in the region. Predictably, the Airborne buy also left DHL's operations with some functional overlaps and redundancies to deal with. One of them was a pair of major U.S. hubs in the Ohio Valley. DHL initially established its main U.S. hub, a 1,800-employee operation in Erlanger, Ky., at Greater Cincinnati-Northern Kentucky International. Then, with its big acquisition, the company added Airborne's 6,600-employee hub in Wilmington, Ohio. DHL's Airborne Express acquisition included the 1,850-acre (740-hectare) Wilmington Air Park (pictured). the location of its primary U.S. hub. Clustering at Wilmington, the company decided, was the logical alternative. Sheer size had much to do with the decision. Compared to the Erlanger operation, the Wilmington hub could handle seven times more package volume, three times more weight and three times more aircraft. That pronounced discrepancy had a lot to do with the size of the Wilmington Air Park. What's more, DHL owned the entire 1,850-acre (740-hectare) site. Airborne in 1980 bought the former Clinton County Air Force Base, which the U.S. Dept. of Defense closed in 1971. That purchase created the largest privately owned airport in the U.S. Ownership added a lot of other bottom-line perks as well. Choosing Wilmington meant that DHL would no longer have to share its runways with any other airlines. Neither would it need to fork over the $2.2 million in annual landing fees that it was paying to Greater Cincinnati-Northern Kentucky International. Located about 34 miles (54 km.) southwest of Dayton, the one-time Airborne site could also provide less stringent noise regulations. As part of the consolidation, DHL added a 1-million-sq.-ft. (92,900-sq.-ft.) two-level freight-sorting building at the Wilmington hub. The project's construction was funded by $300 million in tax-exempt bonds from the Dayton-Montgomery County Port Authority. (Officials in Clinton County, which has about 40,000 residents, said that their area lacked the resources to fund DHL's project.) The Dayton-Montgomery County Port Authority owns the new space added in the consolidation, leasing it back to DHL. Ohio provided a $421-million incentive package as part of its successful pitch to land DHL's hub consolidation. Pictured is Gov. Robert Taft at the project groundbreaking. Ohio's project incentives also included another $122 million in tax incentives and roadwork near the hub site. Completed late last year, the consolidation cost about $350 million in all, company officials said. About $50 million of that total was for closing the Kentucky hub. But those expenditures were far less than the tally that DHL was running up with the redundant hubs. Keeping both facilities in operation was costing the company about $160 million a year, DHL officials said. The project added 600 new full-time jobs and 300 part-time positions at the Wilmington hub. 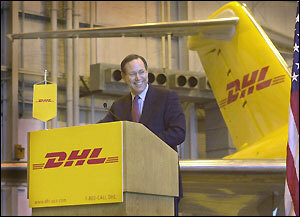 The 6,600 existing jobs that were already at the Ohio site when DHL bought Airborne have also continued. DHL hasn't totally shut down its Kentucky presence. The company's scope there is greatly reduced, though, from the 1,800-employee operation in place when the site was DHL's main U.S. hub. The company now has 300 employees working in Erlanger. That facility functions as what DHL calls an operations center and a "back-up hub." RETURN TO: SITESELECTION.COM OR SITENET.COM LOOKING FOR A PREVIOUS STORY? CHECK THE ARCHIVE. �2006 Conway Data, Inc. All rights reserved. Data is from many sources and is not warranted to be accurate or current.